While Jack Black might be best known today for his roles in movies like Shallow Hal, Kung Fu Panda, School of Rock, Bernie and Nacho Libre, what most don't know or have forgotten about Black is that he came up threw the Hollywood ranks as a character actor before beginning the box office superstar that he is today. As a character actor, Black has had memorable roles in both big-budget Hollywood movies as well as in low-budget indie films throughout the 1990s. Additionally, Black used to be a writer and at-times player on the influential HBO sketch comedy series Mr. Show. Black has had stand-out roles as a character actor in such films as Bob Roberts, Waterworld, The Cable Guy, Dead Man Walking and High Fidelity. But there is one film that Black has appeared in that most haven't seen to date. In Airbourne (1993), Black plays a flunky hockey player tough guy who, along with a few of his jock friends, begin to bully a new kid who moves into town from California. Set in Cincinnati, beach teen Mitchell Goosen moves to the Midwest from California to be with his extended family while his parents are off working in another country, and in the process he stirs the pot. With a California demeanor that doesn't mess while with the mid-western ideas of his cousin (played by a young Seth Green), he encounters a group of jocks that begin to attempt to put him in his place. 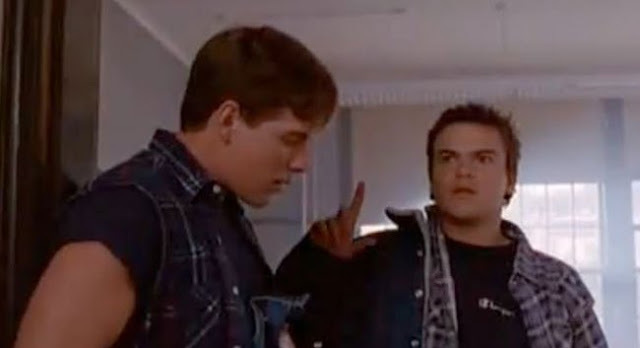 In the end, their differences are settled in a long, drawn-out downhill inline skating race between Mitchell, his cousin, and Jack Black and his hockey-loving tough guy buddies, which is dubbed "The Devil's Backbone." To increase the tension of the story, Mitchell falls head-over-heels in love with Nikki, who has ties in with the tough guy hockey player fellas of the school. In the end, Mitchell wins the race and the hearts of all the tough guy hockey guys, including one Jack Black. Who, prior had been a raging psychopath high school student who loved to bully the new kid in school. While Black's performance in Airbourne is well-done, the role is seemingly out of character for him when you think about what he would go on to become in Hollywood. Yet, tough guy, loner characters were would casting directors were hiring him to play before he got his big break in the city of industry. While Airbourne isn't a very good movie--in fact, it's very cheesy--Black's performance in the movie is great. He's great in the role of the psycho flunky second-in-command in the group of tough guy hockey studs. And while, there are elements of him that one might feel are intimidating, if one was to meet his character in reality--in the end his change of heart will force you to chuckle out loud. Now, this isn't a fault of Black's but of a shoddy screenplay writer who couldn't have possibly taken into consideration Black's penchant for comedy. None the less, Airbourne is a movie that you just have to see to believe. Because they just don't make movies like Airbourne any more.